Ionex car ionizers with it’s patented carbon brush cleans 99,98% of your vehicle’s indoor air. Scientific research indicates that your vehicle’s air is heavily polluted with carcinogenic particles along with viruses and bacteria. 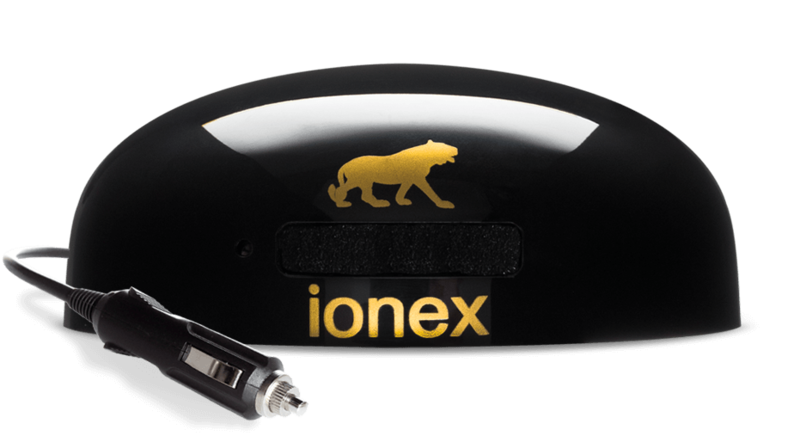 Ionex provides the best car ionizer based on the fact that is cleans your car up to four times faster then any other ionizer currently displayed on the market. Cleaner air in your vehicle will not only make you healthier, but also a more focused and attentive driver. Unbeatable cleaning time – cleans the air up to four times as fast as other ionizers currently on the market. Sweeps through even the smallest air impurities – eliminates everything from dirt, dust, formaldehyde and all the way to viruses, bacteria, exhaust gases, cigarette smoke, pollen and aerosols. Odor free – in addition to its cleaning function, the ionzer also eliminates all bad odor. Did we mention it doesen’t emit any odor itself aswell? Keeps your focus and alertness high –negative ions have been scientifically proven to increase the absorption of oxygen in your blood and thereby improving focus, alertness and safety while driving. Effectiveness does not diminish with time – no matter how long you are driving, the positive effects can be felt throughout the whole time. Reduces levels of stress –negative ions have been scientifically proven to lower the levels of stress hormone, which are always higher while driving. Indoor car air soon becomes supersaturated with positive ions, making it dangerous both for the driver and the passengers. Oxygen level in their blood gets lowered and the results is somnolence, fatigue, slow reaction time, loss of concentration and increased irritation. These consequences can not be diminished or eliminated by heating, cooling or filtration, since they do not affect the quality of air. Air conditioning destroys negative ions too, making air dusty, stale and highly concentrated with harmful exhaust fumes. Negative ions generated through Ionex’s patented carbon brush capture viruses and bacteria, thus leaving the air clean up to 99,98%. Negative ions bind with and remove airborne positive particles. These positive particles include dirt, dust, formaldehyde, resin excretions, viruses, bacteria, odours, mite faeces, dead skin particles, exhaust gases and chemicals. Even the smallest, most hazardous air impurities of size 0,01 microns get removed- cigarette smoke, pollen, PM particles and aerosols. All are successfully neutralized by Ionex ionizer. It is scientifically proven that negative ions lower the level of stress hormone. This makes the driver is more peaceful, concentrated and focused. All of these elements are big contributors to safer driving. This is especially important for professional drivers, since they spend all their working hours in a car. 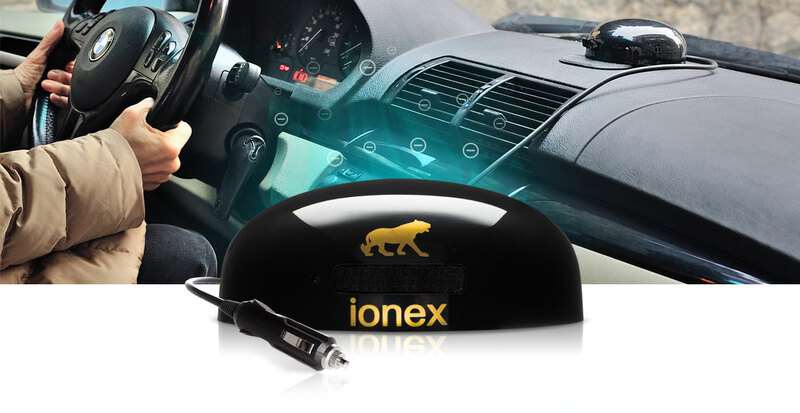 The Ionex car ionizer is an additional value, be one of the safe and healthy drivers with ionization in your car. An automobile metal construction acts like a Faraday cage according to the physics laws. This means that it prevents fresh ionized molecules from outside to penetrate into the car. Negative ions on external side of an atom are very sensitive. They usually drop off after the air hits the metal. Consequently, the air entering the car is rather depleted of negative ions, which means we are soon exhausted.